â€œThereâ€™s no question we got a hell of a job ahead of us,â€� Admiral Lyons said. â€œWith the Muslim Brotherhood penetration in every one of our national security agencies, including all our intelligence agencies,â€� he proclaimed. Admiral Lyons said that our â€œlead intelligence agencyâ€� is â€œheaded by a Muslim convert,â€� a reference to Obama CIA head John Brennan. â€œThe threat is Islam. Letâ€™s make no mistake about it. Thereâ€™s no such thing as radical Islam,â€� Lyons asserted. Author, researcher and investigator of the various causes supported by the CIA, Paul L. Williams discussed his contention that a secret alliance was forged at the close of World War II by the CIA, the Mafia, and the Vatican, in order to thwart the possibility of a Communist invasion of Europe. After WWII, the CIA began a covert operation known as Operation Gladio, using "stay-behind" military units whose missions were funded from black ops like the sale of large supplies of morphine that had been smuggled out of Germany and Italy, he reported. "Operation Gladio has been responsible for millions of deaths, and remains in full effect," he asserted, adding that the members of the units were either fascists or Nazis, though they were trained by US special forces. When Nazi Germany launched Operation Babarossa, the invasion of Soviet Russia in June, 1941, von Mende joined the Hitler-era Ostministerium â€“ the bureaucracy for administering the occupied territories in the East - to build an initiative aimed at cultivating irredentist Muslim movements in overrun Soviet territory. Von Mende was one of the mid-level bureaucrats who participated in the Wannsee conference in January 1942. The Ostministerium oversaw the implementation of the Final Solution of the Nazi Holocaust of European Jews. Despite SS engineered overhauls in 1943 of the Ostministerium, von Mende survived to become overall head of the Foreign Peoples Division, with overall responsibility for dealing with irredentist Muslim communities in Soviet areas overrun by the German army. With the collapse of the Nazi eastern front, von Mende arranged for Muslim units to be transferred to the Western front so as to fall into British and US hands. These units were fighting for the national liberation of their Muslim homelands and attempting to practice their faith. He thought might appeal to the Americans in particular. HIs thinking may have been the result of an encounter with fabled OSS agent â€œRuppertâ€� during the late stages of WWII in Germany when he interviewed von Mende about the anti-Soviet Muslim national liberation activities and contacts at the office he headed in the Ostministerium. Von Mende sought possible refuge by crossing into Switzerland, only to be returned to Germany as the War in Europe came to a close. In October, 1945 Von Mende made contact with the British who appeared to be interested in his Ostministerium network because of the Promethean League members who were anti-Soviet Ã©migrÃ©s. Some Muslim units interviewed by US Army CIC evaded return to ultimate imprisonment and death in a Soviet Gulag under the terms of Yalta agreement. As Johnson notes, perhaps upwards of a few thousand of these ex-Nazi Muslim soldiers end up in Displaced Persons Camps near Munich, the largest city in the American sector of post-war Germany. Von Mende, despite his Nazi background, was interviewed by the CIA, given the code name Capriform and received a position at the University of Munich, as cover. The CIA was very interested in inserting agents into Soviet territory. Ultimately, however, the CIA rejected his suggested approach to information gathering and covert propaganda warfare. Nevertheless, von Mende ultimately thrived by running an independent consultancy in Dusseldorf until his death in 1963. That consultancy was supported initially by British Intelligence and later, with the formation of the Federal Republic of Germany in 1949, by BND Intelligence, Refugee Programs and the Foreign Ministry to monitor Muslim Ã©migrÃ©s. Those new Ã©migrÃ©s included wartime Caucasian and Central Asian Muslim Waffen SS alumni. Among them were Garip Sultan, Ibrahim Gacoglu, and Nurredin Namangani, an Uzbek Imam of an SS division who survived a term in a Soviet gulag. Some became involved in CIA covert antiâ€“Soviet activities during pilgrimages to Mecca. Namagani figures prominently in the failed attempt by these ex-Nazi Muslim soldiers to take control of the Munich Mosque as sought by von Mende. His legacy lived on in the CIA-backed Radio Liberty in Munich with its national liberation desk organization based on his Ostministerium experience, replete with members from the ex-Muslim soldiersâ€™ network. Several of these former Nazi Muslim soldiers were employed by CIA operatives at the American Committee of Liberationâ€™s (Amcomlib) Munichâ€“based Radio Liberty. Someone's pretending that the notion of national security as it surfaced back in 1947 is actually legitimate. Those that funded and established "national security" were and are the only real "terrorists". When Truman signed off on the creation of the NSA, the document(s) were classified, and still are today. Common sense tells you that the reason they're "classified" is because they're unconstitutional, and they don't want anyone to see that these foreign corporations masquerading as part of the government the founders created are nothing more than the British Empire having maintained a stomping boot on top of the Constitution through the "national security" hologram. Who are we allegedly being "protected" from? All "Muslims" designated as national security threats in RAND/CSIS/CFR whitepapers and OP-eds work for RAND/CSIS/CFR. All "Chechens" designated as national security threats in RAND/CSIS/CFR whitepapers and OP-eds work for RAND/CSIS/CFR. All "homegrown/lone wolfs" (LOL, they have the audacity to think things up that do not exist and demand that we believe in their existence) designated as national security threats in RAND/CSIS/CFR whitepapers and OP-eds work for RAND/CSIS/CFR. MUNICH, Germany -- North of this prosperous city of engineers and auto makers is an elegant mosque with a slender minaret and a turquoise dome. A stand of pines shields it from a busy street. In a country of more than three million Muslims, it looks unremarkable, another place of prayer for Europe's fastest-growing religion. The Mosque's history, however, tells a more-tumultuous story. Buried in government and private archives are hundreds of documents that trace the battle to control the Islamic Center of Munich. Never before made public, the material shows how radical Islam established one of its first and most important beachheads in the West when a group of ex-Nazi soldiers decided to build a mosque. The soldiers' presence in Munich was part of a nearly forgotten subplot to World War II: the decision by tens of thousands of Muslims in the Soviet Red Army to switch sides and fight for Hitler. After the war, thousands sought refuge in West Germany, building one of the largest Muslim communities in 1950s Europe. When the Cold War heated up, they were a coveted prize for their language skills and contacts back in the Soviet Union. For more than a decade, U.S., West German, Soviet and British intelligence agencies vied for control of them in the new battle of democracy versus communism. By 1956, a rival emerged to threaten Mr. von Mende's control over the Muslim ex-soldiers of Munich: the American Committee for Liberation from Bolshevism, widely known as Amcomlib. Set up as a U.S. nongovernmental organization to run Radio Free Europe and Radio Liberty, Amcomlib was in fact a thinly disguised front for the Central Intelligence Agency. CIA funding lasted until 1971 when Congress cut Amcomlib's ties to the intelligence agency. During the 1950s, the head of Amcomlib's political organization was Isaac Patch, who is now 95 and living in retirement in New Hampshire. Reached by telephone, Mr. Patch defended Amcomlib's strategy of using Muslims to fight the Soviets. "Islam was an important factor, no question about it," Mr. Patch said. "They were strong believers and strong anti-communists." They didn't penetrate anything, they were used, invited, nurtured,a big puzzle, no. The insiders know this, not the button pushers which in effect are about 80% of our grand agency's hirelings. If they should falter and speak out they are traitors, surrounded by confidentially clauses and boy do they know it. No jo, jail time, disgraced, jobless, shunned, and tracked , destroyed. or the easy way, get mugged/killed, black mail, among other assorted goody's. Our military brass follow orders, OK, but they have the inherit legal right to question! Those who have are sent to patrue with excuses, knowing they are definitely ignored, and in harms way. No MSM will so much as detail, interview.. Journalism is dead, HONOR i on the line, nope it has gone down the memory hole. Flag wiggling pseudos have no idea what is in store for them and loved ones, not to mention our very nation. â€˜If you want to underÂ­stand the strucÂ­ture of politÂ­iÂ­cal Islam, you have to look at what hapÂ­pened in Munich . . . Munich is the oriÂ­gin of a netÂ­work that now reaches around the world.â€™ This quote from GerÂ­man hisÂ­toÂ­rian SteÂ­fan MeinÂ­ing sums up the focal point of this broadcastâ€”the Islamic CenÂ­ter of Munich, a mosque which origÂ­iÂ­nated with forÂ­mer MusÂ­lim Nazi solÂ­diers who had setÂ­tled in that city after World War II. Although the Wall Street JourÂ­nal artiÂ­cle upon which the proÂ­gram is based fails to include a numÂ­ber of imporÂ­tant details, includÂ­ing the MusÂ­lim Brotherhoodâ€™s fasÂ­cist hisÂ­tory and affilÂ­iÂ­aÂ­tions, the story of the Munich mosque chronÂ­iÂ­cles the comÂ­peÂ­tiÂ­tion among the CIA, British and GerÂ­man intelÂ­liÂ­gence for conÂ­trol of the MusÂ­lim ex-Nazi solÂ­diers as tools in the Cold War against the Soviet Union. In so doing, the artiÂ­cle sets forth the Nazi and fasÂ­cist oriÂ­gins of the conÂ­temÂ­poÂ­rary Islamist moveÂ­ment. Along with an artiÂ­cle preÂ­sented in FTR#519, the broadÂ­cast comÂ­prises a good overview of the develÂ­opÂ­ment of the force that spawned Al Qaeda, Hamas and PalesÂ­tinÂ­ian Islamic Jihad. As noted in the artiÂ­cle, the ultiÂ­mate vicÂ­tor in the subÂ­terÂ­ranean politÂ­iÂ­cal strugÂ­gles around the Munich mosque durÂ­ing the Cold War was the MusÂ­lim Brotherhood. ProÂ­gram HighÂ­lights Include: The career of Nazi OstÂ­minÂ­isÂ­terium offiÂ­cial GerÂ­hard von Mende: von Mendeâ€™s postÂ­war work with his MusÂ­lim ex-Nazi solÂ­diers on behalf of the GerÂ­man govÂ­ernÂ­ment; von Mendeâ€™s comÂ­peÂ­tiÂ­tion with the CIA for conÂ­trol of his Nazi MusÂ­lim vetÂ­erÂ­ans; the CIAâ€™s stewÂ­ardÂ­ship of a forÂ­mer Nazi MusÂ­lim named GuaÂ­caoglu; von Mendeâ€™s stewÂ­ardÂ­ship of a forÂ­mer Nazi imam named NamanÂ­gani; Namanganiâ€™s employÂ­ment by the GerÂ­man govÂ­ernÂ­ment as an offiÂ­cial imam (despite his preÂ­viÂ­ous serÂ­vice in a WafÂ­fen SS diviÂ­sion); the CIAâ€™s relaÂ­tionÂ­ship with MusÂ­lim BrothÂ­erÂ­hood offiÂ­cial Said Ramadan; the evenÂ­tual sucÂ­cesÂ­sion of Bank al Taqwa offiÂ­cial Ali Galeb HimÂ­mat to a domÂ­iÂ­nant posiÂ­tion within the Munich Islamic community. The Obama White House has finally released the names of the fourteen Muslim â€œleadersâ€� who met with the President this past week. Among the group â€” which included a comedian, along with a hijab-wearing basketball player and a handful of left wing activists â€” were a select few individuals with disturbingly close ties to the global Muslim Brotherhood. I think they need to start paying attention to the enemy within....more at the link. Islamofascism: With an eye toward the 2016 election, the radical Muslim Brotherhood has built the framework for a political party in America that seeks to turn Muslims into an Islamist voting bloc. 'Muslim voters have the potential to be swing voters in 2016," said Nihad Awad in launching the benign-sounding U.S. Council of Muslim Organizations, whose membership reads like a Who's Who of Brotherhood front groups. "We are aiming to bring more participation from the Muslim community." USCMO also aims to elect Islamists in Washington, with the ultimate objective of "institutionalizing policies" favorable to Islamists â€” that is, Shariah law. This development bears careful monitoring in light of the U.S. Brotherhood's recently exposed goal to wage a "civilization jihad" against America that explicitly calls for infiltrating the U.S. political system and "destroying (it) from within." The subversive plan was spelled out in hundreds of pages of founding archives that the FBI confiscated from a Brotherhood leader's home in the Washington suburbs after 9/11. Translated from Arabic, the secret documents listed a number of Brotherhood front organizations â€” some of which just happen to make up the newly formed USCMO. CAIR is linked in federal criminal court documents to the terrorist group Hamas, the Brotherhood's Palestinian branch. CAIR's chief Awad, who announced the USCMO at the National Press Club, is so radioactive, the FBI refuses to do outreach with him and his so-called Muslim-rights group until it can "resolve whether there continues to be a connection between its executives and Hamas." Equally troubling is the Muslim American Society, another founding member of the USCMO. MAS was formed as "the overt arm of the Muslim Brotherhood in the United States," a 2007 Justice Department court filing states. A 2011 MAS press release praised Osama bin Laden as "a visionary who believed in an Islamic state in Afghanistan." The list of bad actors doesn't end there. The chairman of America's new Islamist party is none other than Oussama Jammal, who once headed the notorious Bridgeview Mosque in Chicago. One of that mosque's leaders was arrested and jailed for funneling millions to Hamas. And one of its most honored guests was bin Laden's spiritual mentor, the late Palestinian cleric Abdullah Azzam. Some of Azzam's relatives are Bridgeview members. "The walls were covered with Hamas posters and recruiting literature showing masked gunmen brandishing automatic weapons. . . . You could see daggers plunged into Jewish hearts wrapped up in American flags," said Steve Emerson, describing the mosque in his book "American Jihad." "They even had a library filled with terrorist videos." As Bridgeview's president, Jammal blasted the FBI for arresting terrorist members and even expressed doubts that al-Qaida was responsible for 9/11. Cloaked from outside scrutiny, the mosque had less and less to do with the needs of Munich's Muslims. And around this time, evidence of the CIA's involvement dried up. Instead, control eventually passed to an unlikely location: Campione d'Italia, a swath of mansions and millionaires in the Swiss Alps. 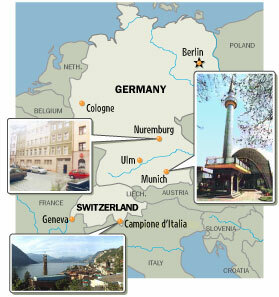 Here, from a terraced villa overlooking Lake Lugano, one of Mr. Ramadan's trusted lieutenants, Ghaleb Himmat, ran the Munich mosque and influenced the network that grew out of it. Of all the characters in the mosque's history, Mr. Himmat is the most enigmatic, although he is one of the few still alive. A Syrian, he went to Munich in the 1950s to study but ended up amassing wealth as a merchant. Now under investigation by several countries for links to terrorism, he normally shuns publicity. He agreed to comment briefly on the telephone for this article. Contemporaries and archival records indicate that Mr. Himmat was a driving force behind the mosque. In 1958, members of the mosque commission say, he led the movement to invite Mr. Ramadan to Munich. Documents show that the two worked closely together. They went on fund-raising trips abroad and Mr. Himmat stood in for Mr. Ramadan when the older man was back in Geneva. Mr. von Mende's death should have left Mr. Ramadan firmly in charge of the project. But over the next few years, he lost control to Mr. Himmat. The exact nature of their split isn't clear, but close associates say it had to do with their different nationalities. Mr. Himmat denies this, saying he does not know why Mr. Ramadan left. At the same time, Mr. Ramadan was losing the support of his Saudi backers. Short of money, he stopped publishing his magazine in 1967. Over the last quarter century until his death in 1995, Mr. Ramadan's influence waned. His son Tariq describes him in a book as prone to "long silences sunk in memory and thoughts, and, often, in bitterness." In late 2013, the proposed mosque was given a new name, the Munich Forum for Islam, apparently in an effort to dispel growing public unease about the mosque's broader ambitions. "By stopping the vote from going ahead, the City Council is preventing your opinion from being abused by the anti-democratic goals of extremists." â€” The Munich Forum for Islam. New Munich mosque gets go-ahead Munich - Plans for a new mosque to be built in Munich got the official go-ahead Wednesday, after years of political wrangling. The city council approved building plans for the 10-million-euro (13 million dollar) mosque to be built in the city centre, despite opposition from Bavaria's Christian Socialist Union (CSU) and another regional party. A broad political majority voted in favour of the project, including Social Democrats (SPD), Federal Democrats (FDP), Greens and the Left Party, according to a city spokesman. The Turkish-Islamic mosque organisation Ditim now has to obtain the funds to buy the land for the mosque by the middle of 2009. THE CREATION OF AN ENEMY. The Muppet masters can sit back and move the meat around..I simply don't underestimate the lengths the powers will go to obtain their goal. ( Adolf's Reichstag), Gulf of Tonkin, 911, WMD's Iraq, oooooooonnnnn & oooooooonnnn. How can we blame the FBI's failure when the CIA is running these guy in and out of the country??? Why have a "homeland" security if only to coverup these operations? But what about eight â€” including a prominent member of ISIS? â€¢ Abdurahman Alamoudi, the mosqueâ€™s founder and first president, who in 2004 was sentenced to 23 years in prison for plotting terrorism. In 2005, the Treasury Department issued a statement saying Alamoudi raised money for al Qaeda in the US. â€¢ Aafia Siddiqui, an MIT scientist-turned-al Qaeda agent, who in 2010 was sentenced to 86 years in prison for planning a New York chemical attack. Known as â€œLady al Qaeda,â€� she is related to 9/11 mastermind Khalid Sheik Mohammed. ISIS has tried to trade her release for journalist hostages. â€¢ Tarek Mehanna, who in 2012 got 17 years in prison for conspiring to use automatic weapons to murder shoppers in a suburban Boston mall. â€¢Yusuf al-Qaradawi, a mosque trustee and Egyptian Muslim Brotherhood leader banned from the US after issuing a fatwa that called for the killing of US soldiers. â€¢Jamal Badawi, another former trustee who in 2007 was named an unindicted co-conspirator in a plan to funnel more than $12 million to Palestinian suicide bombers. Abousamraâ€™s father, a prominent doctor, even sat on the board of directors of the Muslim organization that runs the mosque. He stepped down after the FBI began questioning his son. The FBI suspects Abousamra now operates ISISâ€™s sophisticated media wing promoting the groupâ€™s beheadings and other atrocities through slick videos posted on the Internet. The brutally effective English-language propaganda campaign has helped attract thousands of Western jihadists, including at least 300 Americans. Dzhokar Tsarnaev, who has been arrested for the terrorist bombings in Boston, attended the Islamic Society of Boston. Usually, deleting emails is a no-fanfare, one-click affair -- but not when you're the Central Intelligence Agency or the Department of Homeland Security. Both agencies have recently submitted proposals to the National Archives and Records Administration that outline their plans to delete years' worth of emails, which the Archives has already tentatively approved. The CIA apparently turned one in to comply with the administration's directive, ordering federal agencies to conjure up viable plans to better manage government emails by 2016. If approved, all the correspondences of every person to ever be employed by the CIA will be flushed down the digital toilet three years after they leave. All messages older than seven years old will also be nuked, and only the digital missives of 22 top officials will be preserved -- something which several senators do not want to happen. ... according to former CIA agent Claire Lopez, President Obama has actively worked to forward radical Islam. According to her, the president has gone so far as to switch sides on the war on terror. According to Lopez, the charges she is making are what many in Congress are thinking but darenâ€™t say out loud. The Examiner reported on Friday that Lopez comes well qualified to make such allegations, as she has occupied many senior positions during her career with the CIA. Among other jobs, Lopez is the Vice President for Research and Analysis at the Center for Security Policy and a Senior Fellow at The Clarion Project, the London Center for Policy Research, and the Canadian Meighen Institute. She is also a member of the Citizens Commission on Benghazi and has a lot of experience when it comes to the Middle East and the war on Islamist terror. According to Lopez, the global war on terror, spearheaded by America under George Bush, is more serious than just fighting terror itself. As Lopez told World Net Daily, it was actually an effort to â€œstay free of Shariah,â€� â€” until Obama got involved, that is. Lopez told WND she sees a pattern in Obamaâ€™s actions, or inaction, that reveals his blueprint for the Middle East and Northern Africa is to let the warring jihadi factions, the Sunnis and the Shiites, divide the region into two spheres of influence, and for the U.S. to withdraw. â€œThe administrationâ€™s plan, I believe, is to remove American power and influence, including military forces, from Islamic lands,â€� Lopez asserted. Lopez asks why Obama decided to side with such terror organizations as The Muslim Brotherhood in Egypt as well as its affiliates in other parts of the Middle East. Lopez suggested that the Brotherhood itself has very much infiltrated the ranks of the Obama administration as well as other branches of the federal government. One might be led to think that if international law enforcement authorities and Western intelligence agencies had discovered a twenty-year old document revealing a top-secret plan developed by the oldest Islamist organization with one of the most extensive terror networks in the world to launch a program of â€œcultural invasionâ€� and eventual conquest of the West that virtually mirrors the tactics used by Islamists for more than two decades, that such news would scream from headlines published on the front pages and above the fold of the New York Times, Washington Post, London Times, Le Monde, Bild, and La Repubblica. If thatâ€™s what you might think, you would be wrong. The raid was conducted by Swiss law enforcement at the request of the White House in the initial crackdown on terrorist finances in the immediate aftermath of 9/11. US and Swiss investigators had been looking at Al-Taqwaâ€™s involvement in money laundering and funding a wide range of Islamic terrorist groups, including Al-Qaeda, HAMAS (the Palestinian affiliate of the Muslim Brotherhood), the Algerian GIA, and the Tunisian Ennahdah. Included in the documents seized during the raid of Nadaâ€™s Swiss villa was a 14-page plan written in Arabic and dated December 1, 1982, which outlines a 12-point strategy to â€œestablish an Islamic government on earthâ€� â€“ identified as The Project. According to testimony given to Swiss authorities by Nada, the unsigned document was prepared by â€œIslamic researchersâ€� associated with the Muslim Brotherhood. In reading The Project, it should be kept in mind that it was drafted in 1982 when current tensions and terrorist activities in the Middle East were still very nascent. In many respects, The Project is extremely prescient for outlining the bulk of Islamist action, whether by â€œmoderateâ€� Islamist organizations or outright terror groups, over the past two decades. The Al Taqwa Bank (occasionally Bank al Taqwa or simply Al Taqwa) is a financial institution incorporated in 1988. It is based out of The Bahamas, Switzerland, and Liechtenstein. Al Taqwa Bank was accused by the United States of having links to Islamist terror organizations, and that it was a major source of funds for the operations of Osama bin Laden and his associates. On August 2, 2010, the bank was removed from a list of entities and individuals associated with Al Qaeda that is maintained by the UN Security Council. Youssef Moustafa Nada (born 17 May 1931, in Egypt) is a noted businessman and Muslim Brotherhood financial strategist. Nada is most famous for raising successful European human rights legal cases to defend himself against accusations of terrorism by the United States. The U.S. accusations, made directly after the 9/11 attacks, resulted in his placement on the United Nations Security Council Resolution 1267 terror blacklist. In 2001, Nada, former chairman of al Taqwa Bank, was placed on the UN terror list by the US Treasury Department. Nada was alleged to have financed activities of al Qaeda, charges Nada vehemently denied. The U.S. accusation was made applicable under the UN terror-listing program and affected his life in Switzerland, notably his assets, reputation, honor, and ability to move freely. In 2006, he sued the Swiss government for restitution of financial losses due to the Swiss investigation. By 2009, both the Swiss and Italian investigations of Nada were dropped as no evidence was found to support the U.S. accusations. Both Switzerland and Italy petitioned the UN Terrorism Committee to remove Nada's name from the United Nations Security Council Resolution 1267 blacklist, at the objection of the United States. The U.S. finally acquiesced to his removal on 24 September 2009, but retained Nada on the domestic U.S. Treasury list under Executive Order 13224. The United States refuses to disclose evidence of Nada's guilt, claiming that the evidence is classified. Between 2007â€“2009, Nada's ordeal was the focal point of a Council of Europe Parliamentary human rights investigation of the UN terror-blacklisting procedures, and the UN Terrorism Committee in general. In 2008, Nada raised a case against Switzerland at the European Court of Human Rights in Strasbourg. On 12 September 2012, the European Court of Human Rights ruled in favor of Nada, citing that Nada's human rights had been violated, in the context of the European Convention on Human Rights. In this ruling the government of Switzerland was ordered to pay Nada 30,000 Euros in damages, for their treatment of him as a person placed â€” with no evidence of guilt â€” on the United Nations Security Council Resolution 1267 terror blacklist by the United States. WE: Sibel Edmonds, former FBI Turkish translator and â€œwhistleblower,â€� named Abramowitz, along with Graham E. Fuller, as part of a dark cabal within the US Government that she discovered were using networks out of Turkey to advance a criminal â€œdeep stateâ€� agenda across the Turkic world, from Istanbul into China. The network that she documented included significant involvement in heroin trafficking out of Afghanistan. WE: Graham E. Fuller had been immersed in the CIAâ€™s activities in steering Mujahideen and other political Islamic organizations since the 1980â€™s. He spent 20 years as CIA operations officer in Turkey, Lebanon, Saudi Arabia, Yemen, and Afghanistan, and was one of the CIAâ€™s early advocates of using the Muslim Brotherhood and similar Islamist organizations like GÃ¼len Cemaat to advance US foreign policy. WE: First it should be noted that Russia moved swiftly to ban the GÃ¼len schools when the CIA began the Chechyn terror in the 1990â€™s. In the 1980â€™s when the Iran-Contra scandal broke in Washington (a scheme authored by Fuller at CIA), he â€œretiredâ€� to work at the CIA and Pentagon-financed RAND think-tank. There, under RAND cover, Fuller was instrumental in developing the CIA strategy for building the GÃ¼len Movement as a geopolitical force to penetrate former Soviet Central Asia. Among his RAND papers, Fuller wrote studies on Islamic fundamentalism in Turkey, in Sudan, in Afghanistan, Pakistan and Algeria. His books praise GÃ¼len lavishly. 911. Pandora's box, the gateway to the takedown of this nation. The grand scheme. Pearl, Tonkin, 911, WMD's.. the same planners. It sickens me our armed forces grid bombed innocents based on the lie Iraq factory's of WMD's. No doubt the Muslim brotherhood in a % are involved, so are every other shi**bags on the ole suckstraw. Doesn't say much about our NSA does it. Neither did the fact passenger jets went of course 911 and none of great protectors knew a thing. FAA,NORAD, NSA, DOD and every other alphabetic dept you can name. Just saying, if the MB's got their hands on this they had a lil help from their friends. There is no one group, its a conglomerate. There is no one group, its a conglomerate. No doubt. Plus, there's some serious blackmailing going on - if you like your Supreme Court puppets, you can keep your Supreme Court puppets. IntroÂ­ducÂ­tion: In the wake of the CharÂ­lie Hebdo masÂ­sacre in France, we delve furÂ­ther into the MusÂ­lim BrothÂ­erÂ­hood, the Islamic fasÂ­cist orgaÂ­niÂ­zaÂ­tion at the founÂ­daÂ­tion of so much of the jihadist terÂ­rorÂ­ism afflictÂ­ing the world. PreÂ­dictably, the afterÂ­math of the incident(s) has seen the well-worn rhetoric about â€œIslamâ€� and â€œMusÂ­lims.â€� â€œIs Islam a vioÂ­lent reliÂ­gion?â€� â€œWhy donâ€™t more MusÂ­lims protest against this kind of activÂ­ity?â€� Other equally threadÂ­bare comÂ­menÂ­tary has occuÂ­pied much of the ediÂ­toÂ­rÂ­ial disÂ­cusÂ­sion of the events. What is missÂ­ing is analyÂ­sis of the relaÂ­tionÂ­ship between the Brotherhoodâ€™s Islamic fasÂ­cism and the terÂ­rorÂ­ist groups that occupy the headlinesâ€“Al Qaeda and ISIS (both of which loom large in the backÂ­grounds of the Kouachi brothÂ­ers and Amedy Coulibaily), Hamas, PalesÂ­tinÂ­ian Islamic Jihad and Chechen terrorists. Beyond that, the corÂ­poÂ­ratist ecoÂ­nomic docÂ­trine of the MusÂ­lim BrothÂ­erÂ­hood and the apparÂ­ent use of its knockÂ­off terÂ­rorÂ­ist groups as proxy warÂ­riors by eleÂ­ments of WestÂ­ern and Saudi intelÂ­liÂ­gence are as funÂ­daÂ­menÂ­tal to a true underÂ­standÂ­ing of the pheÂ­nomÂ­eÂ­non and they are absent from the vast bulk of media discussion. IntroÂ­ducÂ­tion: In preÂ­viÂ­ous posts, we have noted that Al Jazeera is run by the MusÂ­lim BrothÂ­erÂ­hood. We have also dealt with the Nazi tract Serpentâ€™s Walk, which focuses on a Nazi takeover of the U.S. in the mid-21st cenÂ­tury. After a series of terÂ­rorÂ­ist attacks feaÂ­turÂ­ing WMDâ€™s results in the decÂ­laÂ­raÂ­tion of marÂ­tial law and the descenÂ­dants of the SSâ€“who have infilÂ­trated the militaryâ€“take over. FunÂ­daÂ­menÂ­tal to the sceÂ­nario preÂ­sented in the book is the UnderÂ­ground Reich/SS money comÂ­poÂ­nent buyÂ­ing into the opinion-forming media in order to swing the AmerÂ­iÂ­can peopleâ€™s point of view in a pro-Nazi direction. With Al Jazeera among those media outÂ­lets gainÂ­ing gravÂ­iÂ­tas in the U.S., it is worth examÂ­inÂ­ing the netÂ­work in detail to underÂ­stand its relaÂ­tionÂ­ship with the BrothÂ­erÂ­hood, an Islamic fasÂ­cist organization. As the White House Countering Violent Extremism Summit is entering its second day, the names of some of the participants are leaking out and raising concerns. This is especially true of the Boston delegation â€“ one among those from three cities that the Obama Administration has labelled a pilot for how religious leaders can work with law enforcement to counter violent threats. 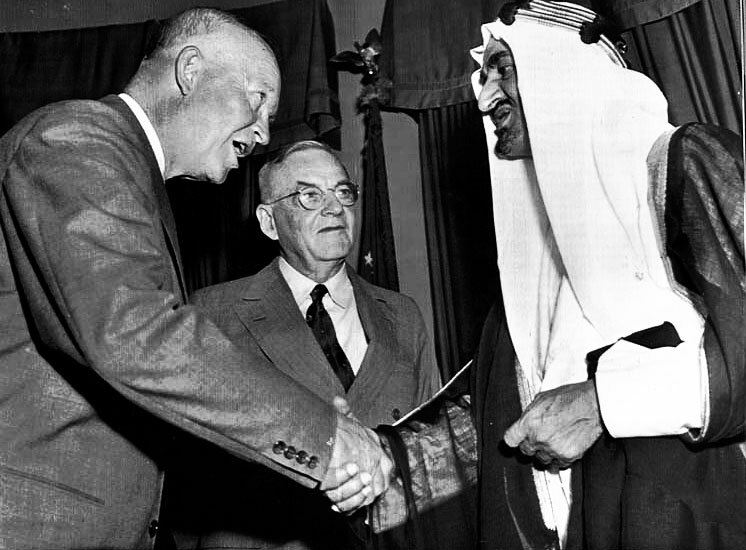 Just as Saudi-US relations had reached their lowest point in 1953-1954, in 1957-1958 they rode on a crest. Eisenhower and Dulles constituted a team that could reply on the presidentâ€™s unchallenged popularity at home and his vast prestige abroad. Dulles had stood up at the United Nations against Americaâ€™s major and indispensable allies in condemning, and reversing, an aggression on a Third World country. 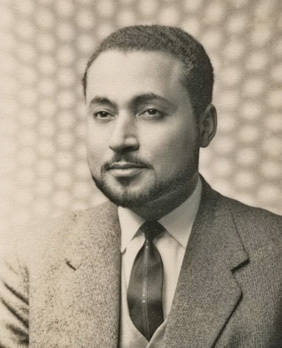 Said Ramadan (Arabic: سعيد رمضان‎; born April 12, 1926 in Shibin Al Kawm, Al Minufiyah, died August 4, 1995 in Geneva) was an Egyptian religious scholar and activist, and a major figure in the Muslim Brotherhood. He was the son-in-law of Hassan al-Banna, the Muslim Brotherhood's founder. After being expelled from Egypt by Gamal Abdul Nasser for his activities, Said Ramadan moved to Saudi Arabia where he was one of the original members of the constituent council of the Muslim World League, a charity and missionary group. He then moved to Geneva, Switzerland, before finishing a dissertation at the University of Cologne in 1959. In 1961 he founded the Islamic Center in Geneva, a combination mosque, think tank, and community center. His son Hani Ramadan now runs that center. Another son, Tariq Ramadan is prominent in international Islamic affairs and academics. Said Ramadan's US connections included Muslim leader Malcolm X. The Centre Islamique de GenÃ¨ve (Islamic Center of Geneva) is also known as "the Little Mosque" of Geneva. It is the oldest Islamic center in Europe, founded by the Egyptian Said Ramadan in 1965. Al Qaeda cell members arrested throughout Switzerland : Islamic Center director Hani Ramadan PR:"We have nothing to hide"
In late October  he is in Nigeria and arrives in Ghana on the 2nd November before moving onto Geneva on the 16th November, he takes in Liberia, Guinea and Dakar, Senegal. While in Geneva he met the exiled Egyptian Muslim Brotherhood operator, Said Ramadan for an evening. The Brotherhood had been proscribed and some members imprisoned in Egypt after their failed assassination attempt on President Gamal Abd al-Nasser. He arrives back in New York on the 24th November after spending a week in Paris. All very strange..... And isn't the story that the Muslim Brotherhood is a Brit run institution more valid NOW??? and isn't it interesting that both Bill and Hill have been CIA/British/Rhodes/Milner/Rothschild assets forever? I teased this story a bit on my June 12th program. For those of you who listened, you know what this is about. For the rest, former PLO member and ex-Muslim Brotherhood activist Walid Shoebat has unearthed some shocking discoveries. Among them is that Anthony Weiner's mother-in-law is a card-carrying member of the Muslim Brotherhood. What makes this a national security issue is the fact that Weiner's wife is also Hillary Clinton's closest adviser. Saleha Abedin belongs to the women's division known as the Muslim Sisterhood. 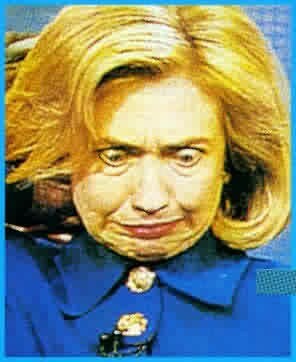 Senator Hillary Rodham Clinton was said to have a lesbian relationship with her aide, Huma Abedin. Someone else vilified Clintonâ€™s central Republican opponent, former mayor of New York Rudy Giuliani: an anonymous individual wrote on his or her blog that Giulianiâ€™s wife was involved in a program to kill innocent puppies to test medical products. Hillaryâ€™s possible lesbianism: Only whispered about til now? 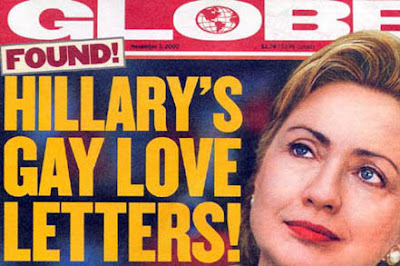 Hillary Clinton a lesbian? With her â€œpersonalâ€� aide whoâ€™s been described as â€œmysteriousâ€� and â€œglamorousâ€�? â€œI am close enough to Hillary and [her personal aide]Huma [Abedin] to tell you that this â€˜rumorâ€™ is true,â€� the official says. â€œIt is well known inside her campaign that Hillary and Huma are an item. Muslim brotherhood has a ways to go to catch these guys. Whenever Israelâ€™s supporters today speak of a â€œspecial relationshipâ€� with the US that is supposedly graven in stone, it is useful to remember that something very different existed when Israel came into existence in 1948 on the gutted carcass of Palestine. The US recognized Israel, but that was about it. Hollywood was (and remains) largely a Jewish preserve, but their level of influence elsewhere â€“ in the government, the media and academia â€“ was limited. Prominent American Jews felt no obligation to endorse Israel or Israeli leaders, no matter what happened. Dozens (including Albert Einstein) signed a letter published in the New York Times in 1948 protesting the arrival of Menachem Begin and condemning his actions. And the general American public was largely indifferent to what happened in the Middle East. The US government echoed these sentiments. Most Israeli military assistance in the 1950s and well into the 1960s came from a scattering of other countries (e.g., the Israeli aircraft that attacked the USS Liberty in June 1967 were procured from France), but not from the US â€“ and American economic aid to Israel during those years was extremely limited. It is noteworthy that in the Suez Crisis of 1956, President Eisenhower â€“ who as General Eisenhower had led the Allied forces in the West that broke Nazi Germany, and was more intimately familiar with the actual situation of European Jews in WWII than any other US president before or since â€“ had no qualms at all about ordering Israel (along with Britain and France) to cease operations against Egypt and to withdraw. Nor did President Kennedy (another WWII veteran, albeit a junior one) hesitate to make it absolutely clear to Israeli leaders that he would not support or condone Israelâ€™s acquisition of a national nuclear force â€“ a position that may well have cost him his life â€“ but also a position consistent with his predecessors that the Israeli tail did not wag the American dog. And the Congress was essentially devoid of Israeli influence â€“ indeed, an Israeli diplomat told me personally that at the time of the 1956 Suez Crisis, Israel had access to â€œonly two minor Congressional officesâ€� (his words). Born in Iran, and educated there and in England, Most Worshipful Brother Hatefi, holds a combined Bachelors Degree in Law and Political Science and a Master of Business Administration Degree. About 20 years ago he came to the United States in search of a new beginning away from his native country. An alumni of London School of Economics and Political Sciences, he pursued advanced studies in the field of freedom of information at the George Washington University. Five years ago he married his lovely lady Farah, both of whom enjoy a high degree of popularity. The Voice of America, where they both work as International Radio Journalists, takes advantage of their linguistic abilities by using their talents in broadcasting to foreign countries. A Master Mason of Iranian Masonic tradition and a Past Master of Hatef Lodge, holden to the Grand Lodge of Iran, Most Worshipful Brother Hatefi quickly became involved in the Masonic fraternity in Washington, D.C. by affiliating with George C. Whiting Lodge No. 22 (now merged with Potomac Lodge No. 5), where he served as Master in 1992. Within the fraternity, our Most Worshipful Brother has set some historical records. He was a founding member and Charter Master of Mehr Lodge No. 90 in 1991. Mehr Lodge was the first lodge to be consecrated in this Grand Jurisdiction in almost half a century and the first bilingual lodge in 114 years to be chartered by the Grand Lodge. Mehr Lodge was authorized by its charter to confer degrees in Farsi, the Persian language. Mansour Hatefi was so successful in governing the Lodge that since then, the Grand Lodge has chartered three other bilingual lodges (Spanish, French, Armenian); a lodge which confers degrees pursuant to the ritual of Scotland; three additional lodges working in English with ritual pursuant to the District of Columbia; and a newly consecrated sojourning Armenian-language Lodge. At present there are under dispensation three more lodges. One is bilingual (Turkish) and the other two work solely in English. Our Most Worshipful Brother, a Royal Arch and a dedicated Scottish Rite Mason, was invested Knight Commander of the Court of Honor in 1993 and was coronated a 33rd Degree Mason, Inspector General Honorary in 1995. He is a member of Almas Shrine Temple, the Tall Cedars of Lebanon, and of the Knight Masons. An accomplished ritualist, Brother Hatefi has served as an Associate Member of the Work and Lectures Committee of the Grand Lodge for a number of years. He is also an Assistant Director of Works at the Scottish Rite of the Valley of Washington in the Orient of the District of Columbia. At present, he is the Senior Warden of Pythagoras Lodge of Research and the Senior Warden of Mithras Lodge of Perfection, one of the four coordinate bodies of the Scottish Rite in Washington, D.C.
With this auspicious beginning and with his dedicated service to the fraternity during his years in the Grand Lodge Line, having been appointed Assistant Grand Chaplain and elected as Junior Grand Steward in 1992. Besides the obvious connections, such as the CIA and the White House, let's get down to those behind the scenes of this quagmire. The support behind Pahlavi is more than that of backing a new "secular" government with a new puppet leader. This is all about the elimination of Islam in the Middle East by those who claim, on the surface, to be Muslims. There is a secret society of former Iranian leaders and power brokers, from the pre-1979 era, who want Iran back under their control. Their motivations are surely not based in Islam regardless of how they portray themselves to be Muslims. Perhaps greed is their motivation, or perhaps they just thrive on the corrupt NWO Rule of Law. Regardless of why, we should all know who is behind all this and why they have enlisted the help of the Mossad, CIA, et al. The Masonic Grand Lodge of Iran, now in exile and based in Los Angeles, was established in 1969 in Tehran. As of 1978, the Grand Lodge of Iran possessed 43 Lodges and at least 1,035 members. During that time, among these Masonic members were most of the Shah's Ministry Cabinet, the regional political leaders of Iran, and the Shah himself. When you read statements made over the past two years by Reza Pahlavi, a pattern can be seen which reflects the foundational beliefs of Freemasonry. Perhaps that is why Pahlavi is a secret member of the Masonic Grand Lodge of Iran. The Masonic connection continues past Los Angeles to the East Coast of the U.S. The Pahlavi office and headquarters in Falls Church has the Washington DC Masonic Grand Lodge to oversee its operations. Mentioned earlier was the name of Mansour Hatefi, the Farsi journalist for the Voice of America. He is also the Grand Master of the DC Grand Lodge, a Master Mason of Iranian Masonic tradition and a Past Master of Hatef Lodge, a lodge under the Grand Lodge of Iran based in Los Angeles. He was a founding member and Charter Master of Mehr Lodge No. 90 in 1991. Mehr Lodge was the first lodge to be consecrated in the Grand Jurisdiction in almost half a century, and the first bilingual lodge in 114 years to be chartered by the DC Grand Lodge. Mehr Lodge was authorized by its charter to confer Masonic degrees in Farsi, the Persian language. The Grand Lodge of Iran Masonic members are the power behind the "secular democracy" they are forcing upon Iran. Along with the help of their non-Islamic "Brothers" in the DC Grand Lodge and junior lodges in Virginia and Maryland, whose members hold White House cabinet positions under the Bush regime, they have the force to accomplish their goal. The North American Blue Jay is a very colorful and beautiful bird. However, their beauty is superficial when you find out that they thrive on destroying the eggs of the peaceful Robin's nests. If you listen closely enough, their vociferous cry seems to yell out "thief," revealing their true nature. The Blue Jays of Iran are returning to their homeland. I only hope that the guardians of Persia can hear their approaching cry before they nest in the trees of Tehran.